Campus recruiting is a daunting, time consuming and necessary task for students looking to enter public accounting. As a professional on the other side of the table, I can’t tell you the number of times the icebreaker is “audit or tax”. This is a common icebreaker but very few students know the answer, audit or tax. As an industry standard, public accounting recruits students at least a year in advance. However, audit and corporate tax classes are generally taken the senior year. This means you’ve chosen your career before you’ve even decided whether audit or tax is right for you. I’m going to share a secret. There’s one question that can help you decide whether your choice should be audit or tax. The question is this… the speed limit is 65mph and you are going 66mph, are you breaking the law? Okay, think about your answer. What do you think? Some students say, no, some say it’s not breaking the law if you’re going with the flow of traffic, others say yes, and others don’t want to answer because they think it’s a trick question. Let me share the secret. How you answer helps define the type of personality you’re best suited for. One extreme, yes, absolutely any time you go over the speed limit you are breaking the law and should be arrested. The other extreme, I’m not breaking the law unless the police officer gives me the ticket. However, most people sit in the middle and lean one direction or the other. A student that’s closer to, “I’m breaking the law because I’m going over the speed limit” is more inclined to enjoy audit. The reason is that in audit you hold the line between right and wrong. You must discuss with clients whether they are stepping over the line or not. You cannot be afraid to have these discussions. On the other hand, if you’re more inclined to say, “I’m not breaking the law unless the police officer gives me a ticket,” then you’re more inclined to be in tax because you’re constantly helping your clients test the line with the IRS, FTB, or other states. You seek to find the loopholes, while audit seeks to close the loopholes. This isn’t an exact science. There are many CPAs who are successful with the opposite traits. 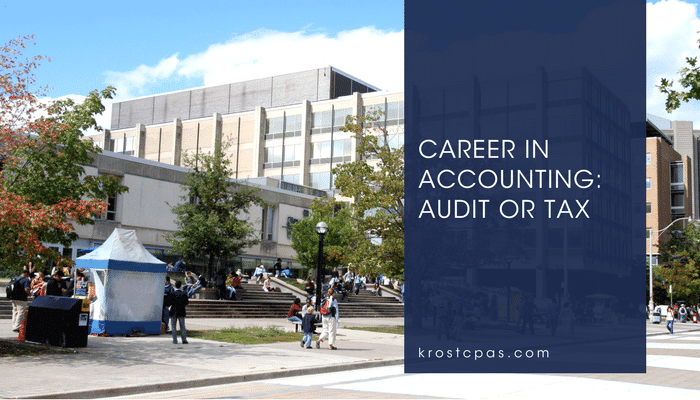 However, for a student who has no knowledge of either audit or tax, this simple question gives them a good framework to investigate and ask more posing questions to the campus recruiters.